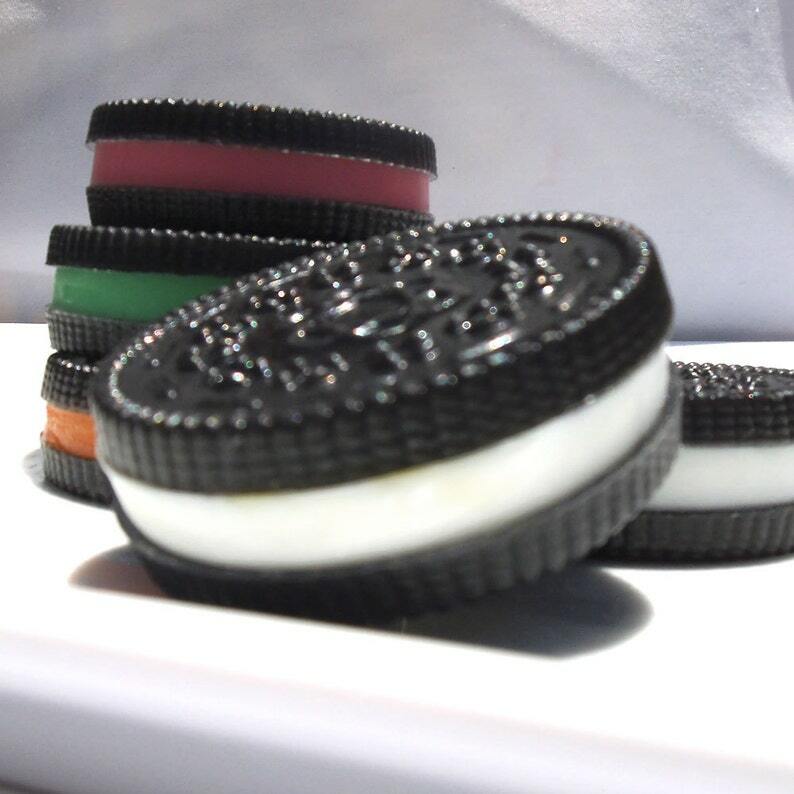 Our cookie soap looks like a real Oreo cookie, but don't eat it! Oreo cookie soap is available in your choice of scent and cream color. 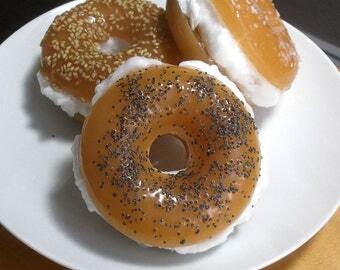 Soap cookies can be used as party favors, a gift for teacher, or even a gift for yourself. Chocolate Cookie - A dark, rich and creamy chocolate fragrance. Chocolate Mint - Chocolate and energizing mint. Cookies & Cream - Cookie dough blended with chocolate chips, vanilla, brown sugar and rum. Soap cookies weigh approximately 1.25 ounces each. Soap cookies measure approximately 2 inches across. Soap cookies are packaged with tag and ingredient list. Because the soap is handmade, there will be slight differences in batches. 1) Message for your custom tags. Choose a tag from the 5th picture. 3) Your party date to be sure they arrive in plenty of time for your event. Vegan & Cruelty Free! Not tested on animals. Tracking information will be e-mailed to you when your order ships. Ingredients: Glycerin (kosher, of vegetable origin), Coconut Oil, Palm Oil, Safflower Oil, Purified Water, Sodium Hydroxide (saponifying agent), Sorbitol (moisturizer), Sorbitan oleate (emulsifier), Oat protein (conditioner), Fragrance, Titanium Dioxide, Color/Iron Oxide/Mica. May contain FD&C/D&C/Lake colorants. They looked and smelled so real that my son tried to take a bite! Quick delivery too! Really nice party favors! Unique and the Sugar Plum smells great. A little on the small side, but everyone loved them. Thank you. Perfect for our baby shower favors. They smell amazing (Lavender) and a very well made. Due to the nature of our personal care items, all sales are final. No refunds, exchanges, or returns. Custom orders are not refundable as they are made to customer specifications. No refunds, exchanges, or returns. We take great care in packaging your items to ensure they will arrive to your location safely and intact. If you have a concern you should request and purchase insurance for your package. If you purchase USPS insurance for your package it is your responsibility to file any and all claims for damage. Orders cannot be canceled. Changes to custom orders cannot be accepted once your order has been started. Be sure to review and verify the accuracy of your entire order. Check your spelling, dates and names carefully. Production time for soap favors is approximately 5-10 business days, depending on the number of soaps ordered. Custom orders can take longer, depending on the size of the order. Orders are placed on a production schedule and processed by date. Production time for non favors is approximately 5 business days after the order is received. We ship most items via USPS Priority Mail. Shipping times provided by third party shippers are estimates and we do not guarantee delivery dates. We are not responsible for postal delays. We rely on third party shippers for this information. You will be provided a tracking number so you may track your shipment. If there are any delays caused by the post office, it is your responsibility to contact them and open a dispute with them. Please check your e-mail address for notification when your order ships. Shipping may include a handling fee. Parabens, Mineral Oil, Petrolatum, Propylene Glycol, SLS, Chemicals, Additives. Due to the custom nature of our products, we do not offer discounts. Production time for soaps is approximately 5 business days, depending on the number of soaps ordered. Custom orders can take longer, depending on the size of the order. We generally make and ship soap favors approximately 10 days prior to your party date to ensure that the soaps are fresh and vibrant. We generally ship all other soap products approximately 5 days after the order is received. Rush orders are addressed on a case by case basis. Rush order fee is $20.00.